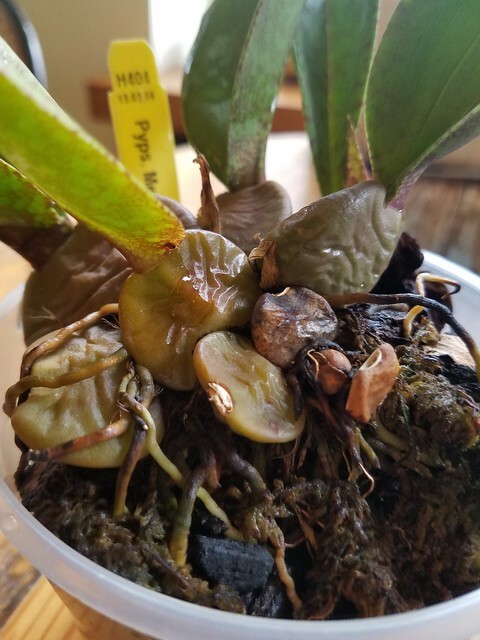 Psychopsis Mendenhall Help - Mites + Repotting - Orchid Board - Most Complete Orchid Forum on the web ! I've got a psychopsis in need of help. Got it about three years ago and repotted it then in medium bark with a little sphagnum on top. 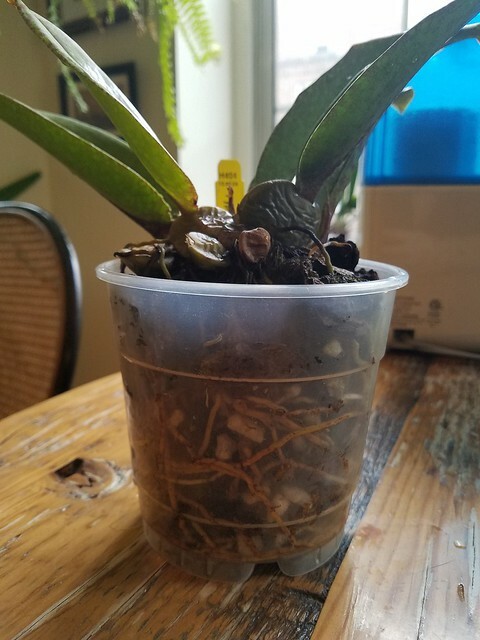 It had about a year of good root growth and grew a new psedudobulb. Then things went down hill. The leaves have faded and lost the strong spotting they originally had. I realized some kind of small grayish mite was proliferating in the orchid (but found very few in neighboring orchids). They went away with increased humidity and regularly rinsing the plant. 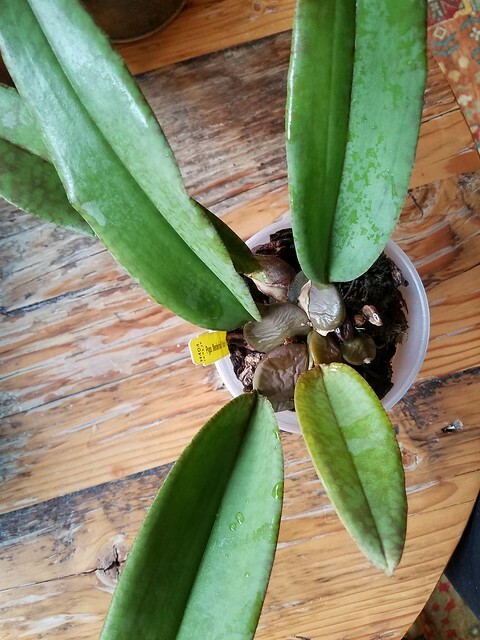 This past year there has been some new root growth and one new pseudobulb, but the leaves have continued to fade and the pseudobulbs have wrinkled and do not firm up after watering. After a few weeks of not really paying much attention to it, I have just realized the mites are back (again, found very few in neighboring plants). 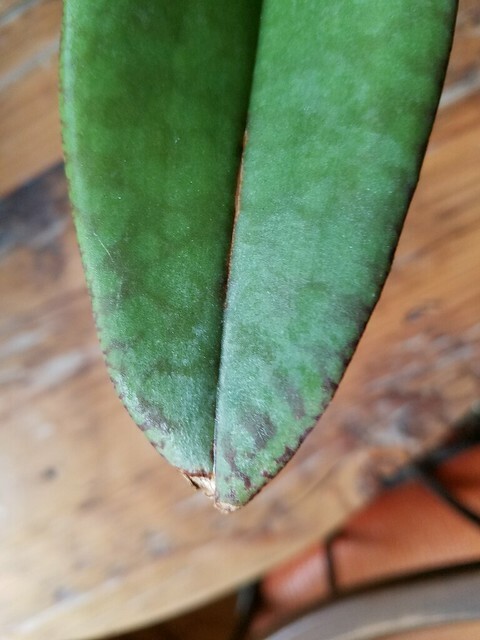 It also has a new whitish coloring on one leaf tip (doesn't quite show in photo)--it's not cobwebby, just looks white and dusty but doesn't rub off. Also the potting medium is pretty broken down. I don’t know anything about Psychopsis but when I had mites on my Dendrobium nobilis I used Organic Garden Safe Insecticidal Soap. I had a light infestation and it took me about 7 weekly applications to get rid of the mites. The soap did damage the flowers but the leaves and canes were fine. I thoroughly drenched the plant even turning it upside down to get the bottoms of the leaves. I want to say mite eggs take around 6 days to hatch so it’s important to stick with the weekly applications. Treat for mites but don't repot - Psychopsis tend to be very unhappy when roots are disturbed. You'll just need to persistent on the mites - they aren't insects (they are arachnids) so pesticides that are aimed at insects don't work. Soap solution and/or a horticultural oil (neem oil is good... you put soap in the solution with that too to emulsify the oil in water) drowns mites and other pests. But it doesn't touch eggs, so you have to repeat over a number of weeks to get the successive generations. Has your light or watering changed? Watering has generally been a weekly 20min soak with misting 2x a week. However the apartment is very dry with apprx 25% humidity. It sits next to a humidifier but the top is often quite dry while it seems the bottom of the pot might stay too wet. Recently I've noticed that the pseudobulbs seem to just stay shriveled regardless of watering. Light is east-facing. No change other than seasonal. @Roberta @Alice Thanks for the suggestions. I forgot about Safer soap but I actually have some. I don't like to use it too much because of the smell but I may resort to it. Back in the days when I lived in a condo (nearly 13 years ago now) I had my Psychopsis on a shelf in the upstairs hallway, where they got a lot of light from a window that ran the length of that area. These put up with the dry indoor air with no particular TLC, and grew better than pretty much any other orchids that I was trying to grow in the house. Now they live in the greenhouse (which I got when I acquired a house with a yard) and are still going strong. So I have had several of these for about 20 years across the two abodes, and they get (and want) really minimal care. They don't get repotted until they're climbing out of the pot. Then I just shake off the bark that comes off easily, drop into a slightly larger pot, and add some bark (I use Orchiata, which does not tend to break down - pure inorganic media may be just fine, mine seem to be happier with at least some bark) Fortunately these grow slowly and so don't add a lot of bulk. Last edited by Roberta; 12-03-2018 at 05:20 PM.. I'm starting to wonder whether these might prefer warm summer nights. Members of our orchid society find them to grow a lot faster than reports I read here from people in cooler climates. I have a small seedling that I haven't been able to water enough, so it has struggled. I set up a temporizing automatic spray system for watering at the end of October in my sunroom, and I'm going to put in a more refined version over the winter. I just repotted mine in August (probably a bad time, but I just got him) - since then have gotten a new leaf. Roots were almost non-existent at time of repot. He takes a while to dry out though - so I water maybe every 14 days. But in a GH humidity, so the top of the pot dries out almost as fast as the bottom. I actually think your plant looks okay - but agree your media looks old. If you think he can hold out till spring, then wait. mites hate humidity, and 20% is low, and I would think that is causing some of the problems you are having. The other being a light issue - they color up better with stronger light.